A great dish to serve your guests as you relax on the patio or deck this summer! Chilled melon soup may be just the ticket for serving your summer guests a surprise treat! Your guests mouths will water as you bring this delicious "soup" to the deck or patio table! What could be better that fresh, chilled fruit? We are huge fans of cantaloupe! Cut at just the right time, cantaloupe brings a sweet, sensual flavor that is the essence of summer. People think I am a little off but I like my cantaloupe chopped with a sprinkle of black pepper on it. You should try it sometime! 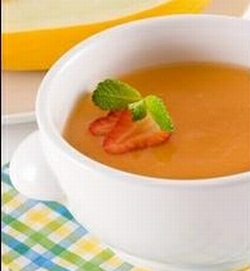 But this delicious melon soup recipe is also a great way to use cantaloupe as well as strawberries and even a little lime juice. It is cool and refreshing. Cantaloupe - at least the edible part - is almost 90% water. That makes it low in fat. It is however, fairly high in sugars and does not provide an over-abundance of either protein or fiber, although there is some. But it is a great source of Vitamin C, some Vitamin A and a really impressive amount of potassium, with around 273 mg in a large slice. So whether its sliced or cubed or made into a delicious soup like this recipe, cantaloupe is a good bet for fresh summer eating! And although "soup" may be a slight misnomer because we tend to think of soups and stews as being warm or hot dishes, we encourage you to try this soup recipe soon. Per serving: 85 calories, 0 g total fat (0 g saturated fat), 22 g carbohydrate, 1 g protein, 1 g dietary fiber, 26 mg sodium.